Bat enthusiasts from all over the world travel to Austin, Texas every summer to attend and participate in the annual Austin Bat Festival, or also known as Austin Bat Fest to most bat enthusiasts. The South Congress Bridge Bats put on a nightly spectacular show of dynamic aerial flight typically lasting 45 to 60 minutes long. Show up early enough to take advantage of first serve free parking. Click link below to find additional non-paid and paid parking located near Auditorium Shores and the Austin Statesman. Simply put, people are batty for Austin’s world-renowned Mexico free-tailed bats and their night flight of 60-plus miles per hour and 2-mile high flight patterns, and feeding frenzy of Austin insects. Thanks to Lady Bird Lake, formerly Town Lake, circa 1980 renovations making a home for the bats in Austin, Texas, the South Congress Bridge, also known as the Ann W. Richards Congress Avenue Bridge, bats put on a nightly spectacular show of dynamic aerial flight typically lasting 45 to 60 minutes long. Whether attending the Austin Bat Festival, a visiting tourist, or a Keep Austin Weird local, bats in Austin under the South Congress Bridge entertain and amaze all walks of life, from the youngest to the oldest. From March through November of each year, large groups of locals and tourists visit bats in Austin, Texas. Each night between 5:30PM to 6:30PM, many bat enthusiasts and watchers stake out lookout spots below and above the South Congress Bridge. 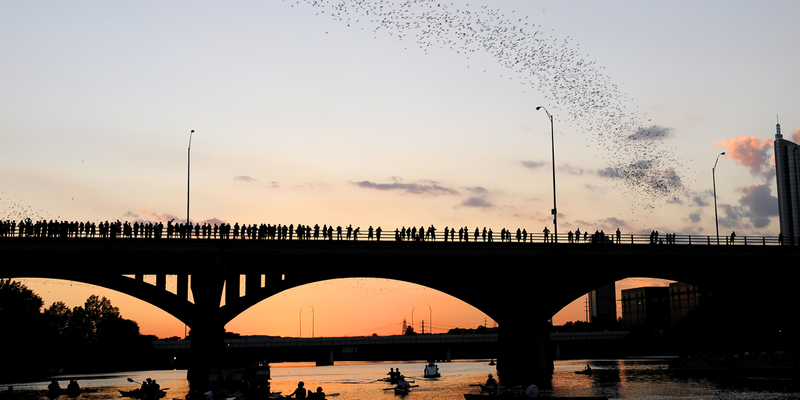 It’s one of the best places to catch a direct view of the South Congress Bridge Bats, also known as Brazilian free-tailed bats, emerging and shooting out for their nightly feeding and aerial show. The bats in Austin are a medium-sized bats with broad, black, forward pointing ears, and wrinkled lips, long and narrow wings, and typically attain reddish to dark brown or gray fur color. Their tails extend more than one third beyond the size of their body, offering bats in Austin great flight patterns and precision. The bats of the South Congress Bridge in Austin, Texas also help keep Austin’s insect population at bay and in check. 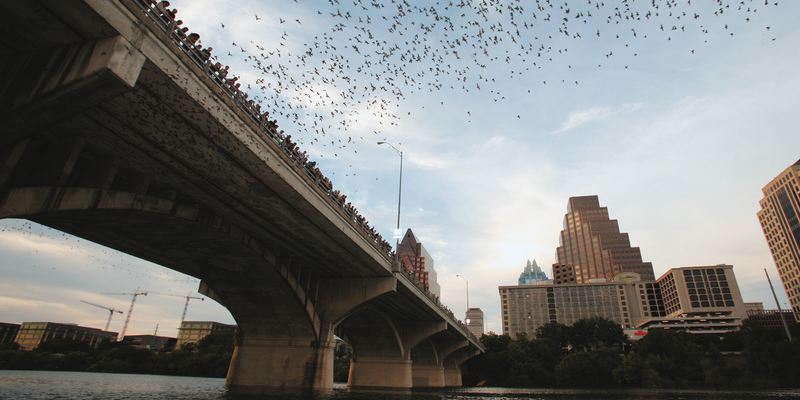 Eating roughly 20-30 thousand pounds of insects on each night flight, nearly one and a half million bats in Austin call the South Congress Bridge home during this time period. Most bat colonies of a million or more can consume up too 250 tons of a variety of insects in a given night. Drawn to areas with water access and warm conditions, most bats in Austin delight in moths, crickets, grasshoppers, and Texas-size mosquitoes that the South Congress Bridge offers in great number. 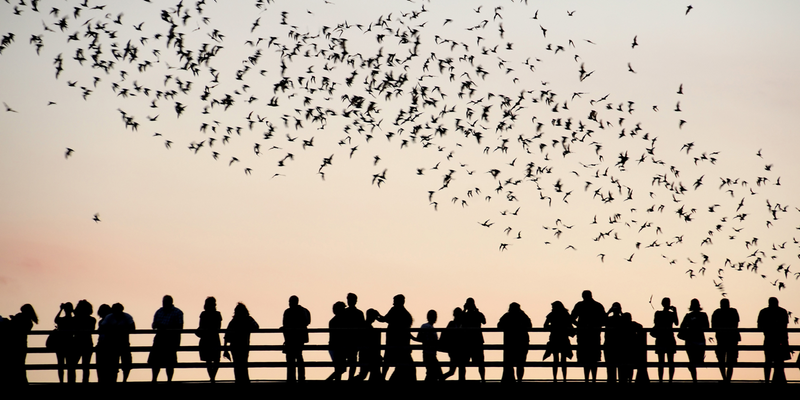 Come join a wide range of locals, bat watchers and enthusiasts near dusk at the South Congress Bridge for batty night of fun with the South Congress Bridge Bats in Austin, Texas. Oh yes, and don’t forget to bring your blankets and covers for the grass covered area, wear a hat or bring some other head covering as we would hate for bat droppings to land on your do by chance. Please make sure all items you bring to watch bats in Austin are bat friendly and bat safe for your own bat viewing and bat watching experience. Please do show up early enough to take advantage of first serve free parking, and learn about Nightwing sculpture located onsite. Other non-paid and paid parking is located near Auditorium Shores as well as the Austin Statesman. And it goes without saying, but please no handling of these beloved bats as we are visitors within their habitat. Please keep their habitat clean from pollution and contamination by picking up and throwing away your trash should you have any or should you see trash. The bats in Austin, Texas will greatly appreciate and reward all of us continually to call and make Austin, Texas their home and with a spectacular nightly summer aerial show. For more specific updates and information as it pertains to visiting bats in Austin, Texas and surrounding areas, please contact the Bat Conservation International at 512-327-9721. Also, we invite you to explore other bat-watching sites throughout Texas. Time: Each night between 7:30PM to 8:30PM. Things to buy wear: Bat Shirts, Bat Hats, Bat Necklaces, Bat Blankets, any and everything bat friendly and bat safe! BatsInAustin.com is a participant in the Amazon Services LLC Associates Program, an affiliate advertising program designed to provide a means for sites to earn fees by linking to Amazon.com and affiliated sites. Copyright 2018. All Rights Reserved.